Artist's concept of an object flung from a black hole. Space is a dark void filled with trouble: comets, asteroids and, of course, black holes. But what if it turns out that our galaxy's black hole is shooting out planet-sized spitballs? That is exactly the case, according to the Harvard-Smithsonian Center for Astrophysics. 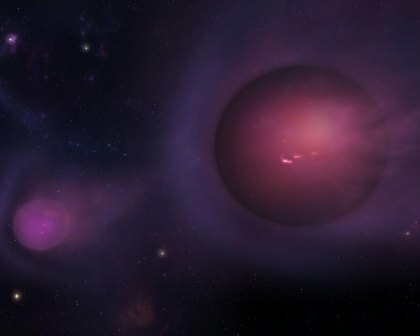 Working with computers, researchers sought to understand what happens when the black hole at the center of the Milky Way comes in contact with a star. Eden Girma, an undergraduate student at Harvard University who is lead author on the research,wanted to find out how close these giant “spitballs” come to Earth. “The closest of these planet-mass objects might be within a few hundred light-years of Earth,” the news release explains. The weight of these objects would be something between Neptune and several Jupiters. Most are zooming along at 20 million mph and swiftly leave the galaxy. THE MOON IN OLD AGE: The moon is 40 million to 140 million years older than thought, according to new research from University of California, Los Angeles. That analysis enabled the researchers to get a handle on the moon's age.